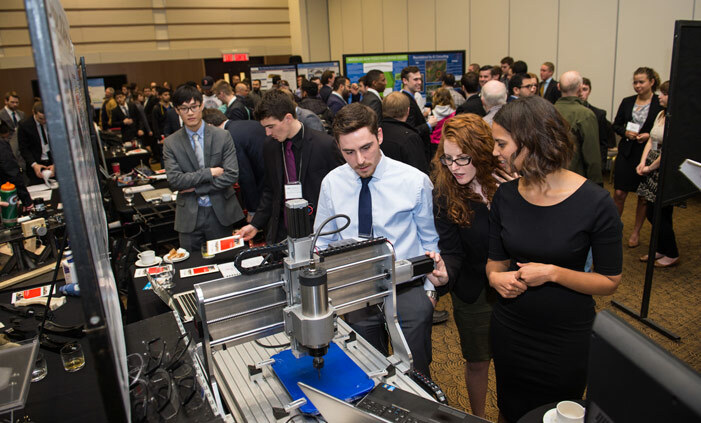 The University of New Brunswick’s faculty of engineering is hosting its third annual Engineering Design Symposium (#UNBDesign) on Thursday, March 30, 2017 at the Fredericton Convention Centre from 8:20 a.m. to 5 p.m. The symposium, one of the faculty’s premier annual events, will showcase the designs of 300 final-year engineering students in all disciplinary capstone design courses. Local governments, companies, and non-profit organizations sponsor a large number of the design projects, allowing students to get hands-on experience in solving real-world design issues and challenges. UNB President and Vice-Chancellor Dr. Eddy Campbell says he’s seen a growth in this symposium over the last three years and credits that to the community partnerships that have been formed with the university. “This is a perfect way to show our community the direct impact experiential learning is having on our students and the benefits our students have on the community.” said Dr. Campbell. Dr. Chris Diduch, UNB’s dean of engineering, is encouraging the public and the UNB community – particularly early-year engineering students – to come see what students have been working on throughout the year. To make it easier for students, faculty and staff to attend, the faculty of engineering has hired a bus to bring people between UNB and the Fredericton Convention Centre. Buses will pick students up at the main entrance of Head Hall every half hour beginning at 8 a.m. The symposium is open to the public from 8:20 a.m. to 5 p.m. on March 30 and all are encouraged to stop by. For more information, contact Heather Jones.